This listing is for 100 sheets of premium quality A4 sublimation paper, which is the same as we provide in our sublimation printer bundles. This paper is for use with sublimation ink only, and is not suitable for use with toner or pigment inks. Used in conjunction with our sublimation inks, these papers provide results which consistently outclass the opposition and produce outstanding quality t-shirts, mugs and more. With sublimation paper, there are two main aspects which you should pay attention to. These are how the paper absorbs the ink, and how it releases the ink onto your substrate. Sublimation papers can all look very similar, and work based on the principle of a polymer management layer and release agent, but the recipe can vary substantially from one brand to another - it's important to find the paper which works best for your setup. If your sublimation paper isn't capable of absorbing the ink quickly enough, your images can bleed and appear fuzzy around the edges. This bleeding will transfer across to the finished product, and can leave you with mugs and t-shirts looking sub-par. I'm pleased to say that only one of the papers in our test had this problem, and it wasn't ours. Most sublimation papers on the market today are what's known as fast-drying papers, so will readily absorb the ink during printing. You'll find far more variety when it comes to releasing the inks. Ideally, you would have close to 100% of the ink transfer from your sublimation paper onto the finished product. Having more ink transfer means that your blacks will be richer, your colours more vibrant, and you will achieve much better results overall, allowing your images to really stand out. It also makes colour-matching easier, as you don't have to worry about your images looking washed-out or faded. If you would like to see how we tested this paper against the offerings from some of our competitors, you can read our blog post here. We also offer this paper in A3 and pre-cut mug size. 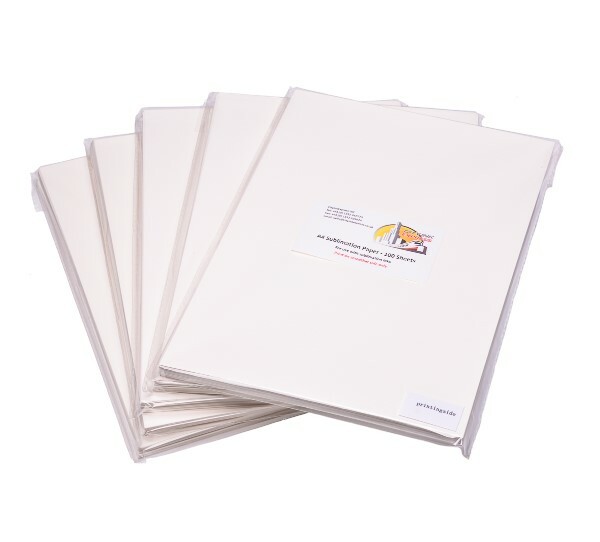 100 sheets of 100gsm A4 size sublimation paper.